Situated on Granbury’s Historic Square, the First National Bank (101 East Bridge Street) was constructed in 1883 and is an example of Italianate Victorian Commercial architecture. The building was constructed for its current use and more of the history can be found here. The entirety of the Granbury Square is designated a historic district and was named the best historic square in Texas. And while I was there I took a picture of the wonderful courthouse. This entry was posted in Granbury, Historic Sites, National Historic Register, Office Space and tagged bank, First Natinal Bank, Granbury, Granbury Square, historic, official historical medallion, Square, state historical survey on August 5, 2016 by admin. There I was at the Granbury Post Office mailing some paperwork to my niece. Looking for something else to do, I stopped at the firefighter’s memorial and from there I could see a plane! OK, that’s cool. I backtracked down the road and through the open gate of the US Veteran’s Museum. Just past the building, which was closed, I found the plane. A gentleman in a riding mower came to check out my intentions and told me that the museum had been closed for about a year. I found out later it had moved to nearby Glen Rose. I let him know that I was harmless and just wanted to snap a couple of photos, which I did while circling the plane on foot. The google map showed the plane complete, however, the wings had been removed and were next to the rest of the plane on the ground and the tail was missing. Since the museum is closed, I won’t suggested anyone else going to visit though a locked gate and/or no trespassing sign would have prevented me for seeing this kind of great plane. The riding mower man made sure I actually left and good for him for watching out for the property. This entry was posted in Granbury, Museums, Other States - Texas, Their future is in question and tagged 675, airplane, closed, Granbury, moved, museum, plane, US Veterans Museum, veterans, vets, war on August 4, 2016 by admin. Flying back to Washington from Texas, we followed the sunset for about two hours. I was really surprised at how long we kept up. 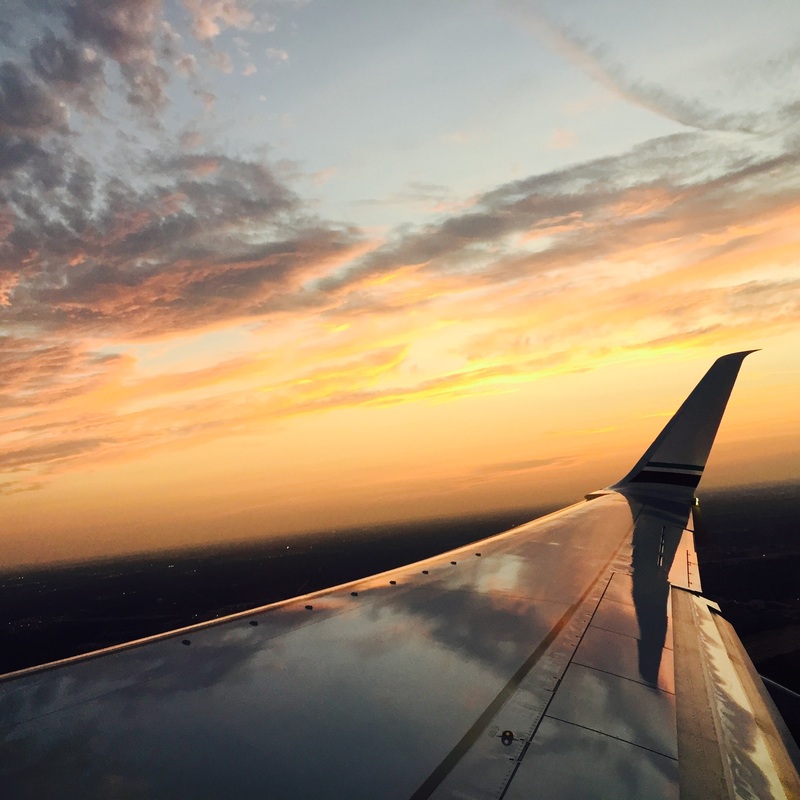 This entry was posted in Once in a while events, Other States - Texas and tagged Air, flight, sunset, wing on August 26, 2015 by admin. Catching Up from the Texas trip. While in Texas I got in a short visit with some very dear friends and they took me to see the recently opened Klyde Warren Park in Downtown Dallas. The 5+ acre park opened in 2012 and is constructed over the Woodall Rodgers Freeway at the edge of the city’s art district. This privately managed park features various food trucks, a children’s area with a tree house, a dog park, outdoor seating, water features, gardens and a putting green. There was a very positive feel to the place as folks enjoyed the sunshine and one another’s company. The one photo shows my ice cream sandwich with homemade cookies and ice cream 🙂 The bee actually got stuck to my hat, making for an easy photo. Yes, he then flew away. This entry was posted in Dallas, Food Truck, Other States - Texas, Parks, Restaurants and tagged arts, arts district, bee, Dallas, dog park, food trucks, Fountain, gardens. 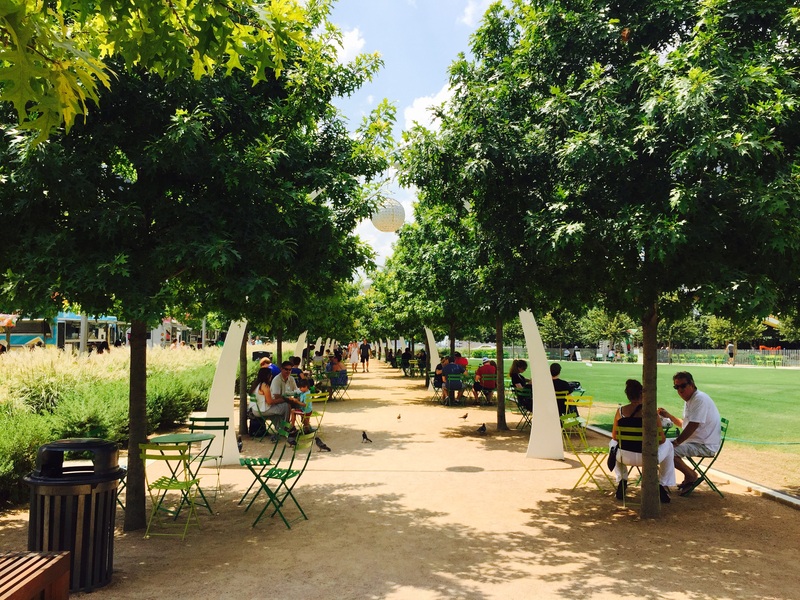 children's area, ice cream sandwich, Klyde Warren Park, seating, sunshine on August 26, 2015 by admin. There is some debate on the fate of John Wilks Booth. Most say he was killed by Federal soldiers who had tracked him down at the Garrett Farm. But the more interesting theory is that the wrong man was killed at Garrett Farm, Booth escaped to Granbury, TX, changed his name to John St. Helen and tended bar in what is now the Nutshell Cafe. While extremely sick, St. Helen made a death bed confession, but then he recovered. Since his story was then out there, he needed to leave town. He went to Enid, Oklahoma where he committed suicide. A book, Escape and Suicide of John Wilkes Booth by Finis Bates, was written about this (that part is for sure true). Bates later gained control of St. Helen/Booth’s body and exhibited in carnival sideshows. 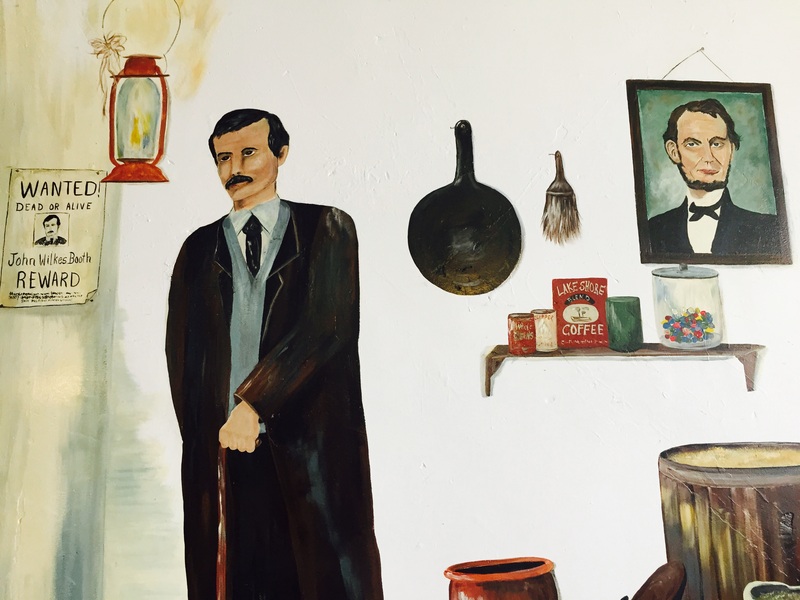 So, that explains where there is a mural featuring John Wilks Booth next to his wanted poster and near a picture of Lincoln. The mural also features the Lady in Red, who was suppose to be the love of Booth’s life. And on the other wall is Davy Crockett. The Nutshell Cafe is reportedly haunted by the Lady in Red with her boyfriend, Booth, supposedly haunts the adjacent Granbury Opera House. On a lighter note, I found the coffee to be good at the Nutshell Cafe and would be glad to go back to try the ice cream. This entry was posted in Art -- there is art here!, Coffee Shops, cafes and bistros, Granbury, Historic Sites, Other States - Texas, Restaurants and tagged cafe, Davy Crocket. coffee, Garrett Farm, ghost, Granbury, haunted, ice cream, John St. Helen, John Wilks Booth, Lady in Red, Lincoln, mural, Nutshell, Nutshell Cafe, restaurant, sideshow, Texas on August 24, 2015 by admin. A dear friend of the family and I had a summer goal of finding the alleged grave of Jesse James in the Granbury Cemetery. We had tried last summer, but had no luck in the approaching dark. This time we set out in early evening and found Jessie’s grave, as well as Granbury’s grave and the burial site of an amputated arm. Granbury (sometimes seen as Granberry) is the namesake of the town. As far as I can tell he never lived in Granbury, but his body was exhumed (for the second time) and buried here. There is also a gravesite for his wife, Fannie Granbury, though she isn’t buried there. She died at the young age of 25 and is in an unmarked grave in Alabama which is where she died of natural causes. The buried arm is that of W. H. Holland who lost his arm in a childhood accident on November 16, 1895. The rest of Mr. Holland died sometime later and is buried elsewhere in the cemetery. The photo that shows that is of three above ground tombs. The arm is in the middle and there are infants to either side. History tells us that the outlaw Jesse James was killed by a member of his gang in 1882 for the reward money. 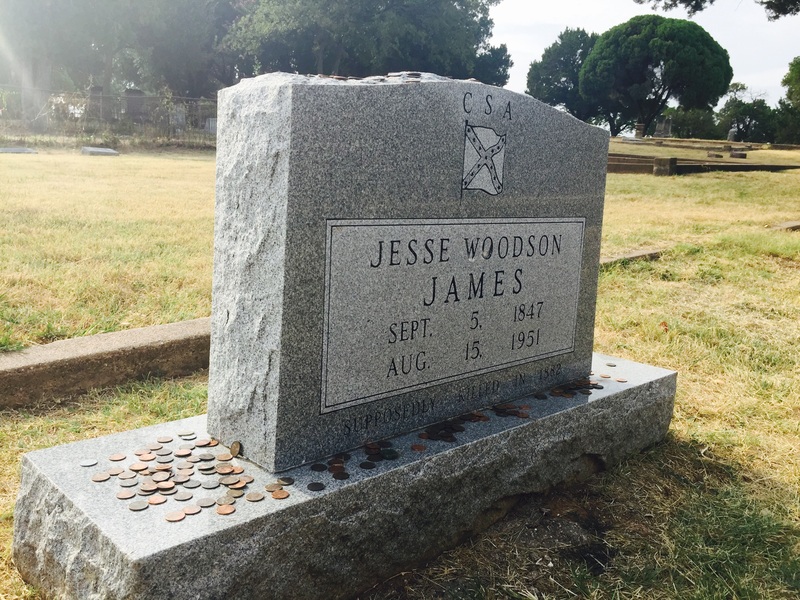 However, relatives of James say that his death was faked and it is really somebody else buried in Missouri in a grave labeled Jessie James. The story goes that James was even a pallbearer at his own funeral! James took the alias of J. Frank Dalton and settled in Granbury eventually passing away in 1951 at the age of 103. Apparently toward the end of his life he even confessed. At the bottom of his headstone (look hard!) it says “supposedly killed in 1882”. Haunted Granbury by Brandy Herr is full of interesting stories and well worth reading. This entry was posted in Cemetery, Granbury, Historic Sites, Other States - Texas and tagged amputation, arm, Brandy Herr, cemetery, County, Frank Dalton, Frannie Granbury, funeral, ghosts, Granberry, Granbury, graves, gravesite, Haunted Granbury, headstones, history, Hood, J. Frank Dalton, Jesse James, supposedly, Texas, W.H. Holland on August 23, 2015 by admin. 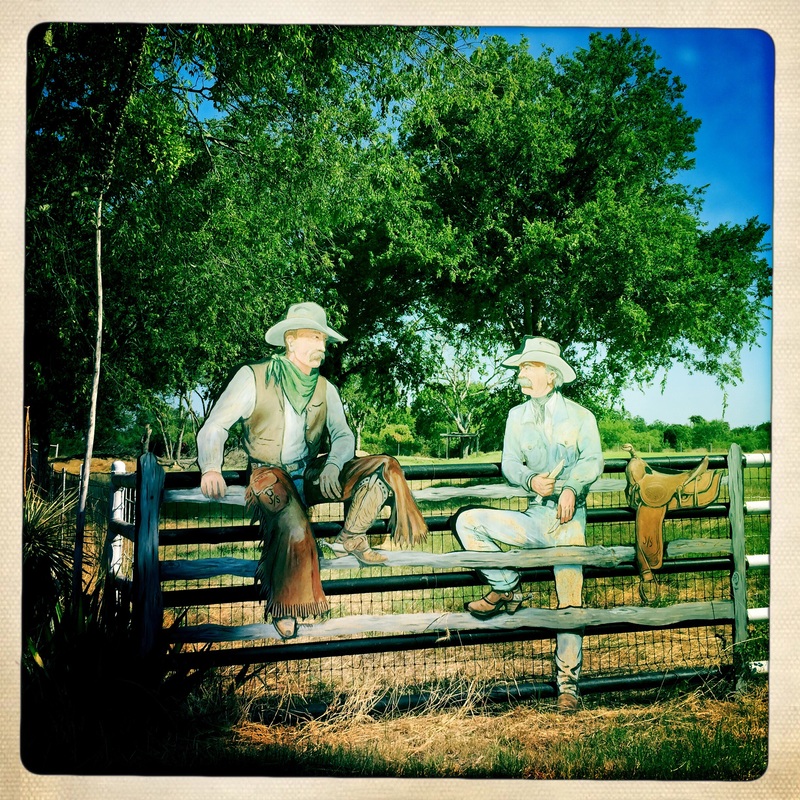 On a back country in Parker County Texas road I found this wonderful cowboy art at the entrance to a private ranch. Here is the site via Google Earth. This entry was posted in Art -- there is art here!, Other States - Texas and tagged art, Cowboy, Kelly Road, Parker County, ranch, Texas on August 15, 2015 by admin. 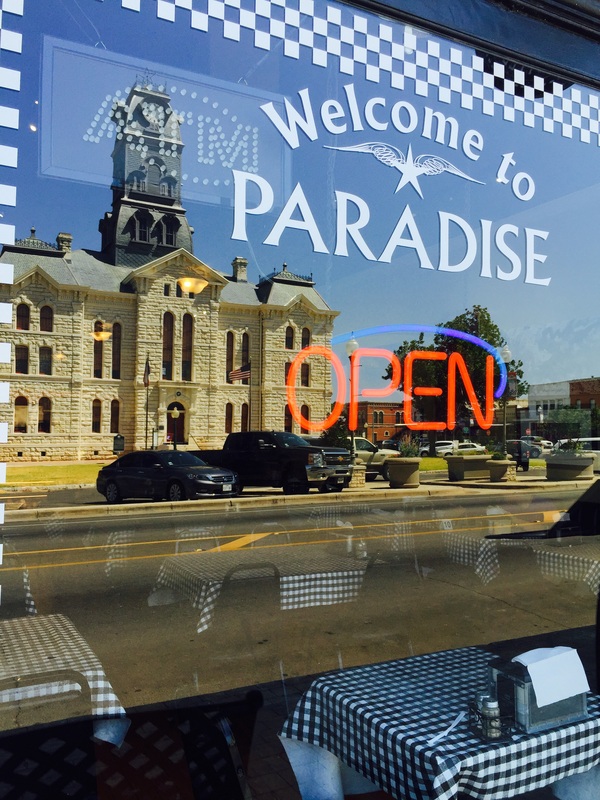 Paradise Bistro & Coffee opened on the Granbury Square in 2012, I stopped by for some relief from the heat and an iced coffee and slice of lemon cake. It was really a treat and I happily spent some time there reading my book. On the way out, I was given a ‘to go’ cup with ice water. They do understand that dehydration is a problem here in Texas! The website for the bistro is here. The window looking into the space clearly reflects the historic Hood County Courthouse which was constructed in 1890. The courthouse is the focal point of the Granbury Square. The business is located in the two story masonry Harris Building, which was constructed in 1899 by local stonemason, I. W. Walley. It was originally occupied by a furniture store, It has a cast iron storefront. This entry was posted in Coffee Shops, cafes and bistros, Granbury, Historic Sites, Other States - Texas, Restaurants and tagged bistro, cafe, cast iron, castiron, coffee, Granbury, Granbury Square, Harris Building, Paradise, turn of the century, Walley on August 14, 2015 by admin. When I was a kid my parents took me to the World’s Fair in New York and there was a dinosaur exhibit. 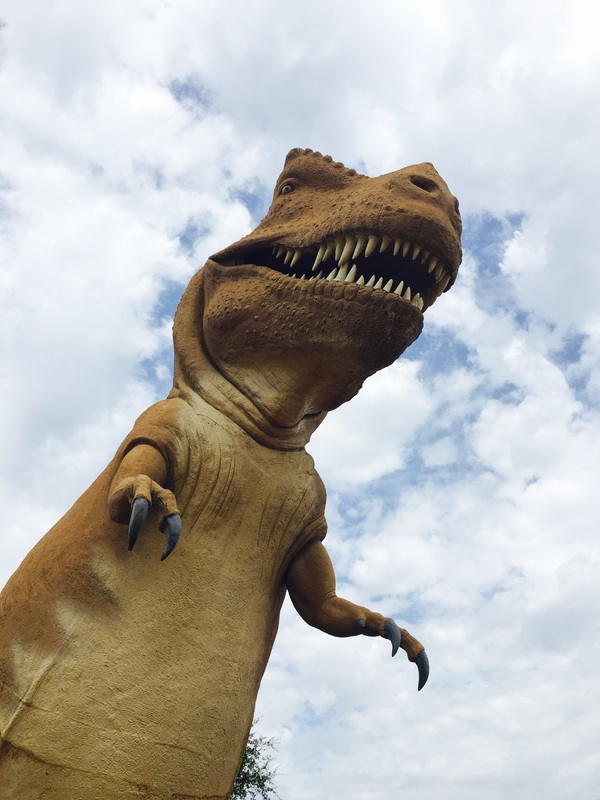 I was startled to realize that two of those dinosaurs, the Apatosaurus and the T-Rex, had been relocated to the Dinosaur Valley State Park in Glen Rose, Texas. The Atlantic Richfield Company donated the fiberglass replicas to the park in 1970. The park did not get its name from the two replicas however, it is the site of real dinosaur footprints! The 1,587-acre Dinosaur Valley State Park opened in 1972. Its mission: to preserve these valuable dinosaur track sites and to allow people to learn from and enjoy them. It is situated on the Paluxy River and many of the tracks on near or in the river. About 113 million years ago, this area had been ocean front and the ground was the perfect place for creating fossils. Both Herbivores and Carnivores would come to this area to eat plants and in the case of the Carnivores each other. There was an enormous river flood in 1908 and in 1909 a young boy, George Adams, found three-toed tracks of theropods. Sometime later, in 1937, R.T. Bird, who collected fossils for the American Museum of Natural History came to the area and found tracks of the much larger sauropod (70′ long, 13′ high, 40+ tons). Some of the park’s visitors were very interested in the tracks. One can go right up to many of them and touch them and even stand in them to get a sense of scale. Other park visitors were more interested in cooling off in the Paluxy River. I visited the two main track sites and also drove around the camping area. There were plenty of spaces available, no doubt the heat was keeping folks away. I would have stopped at the Creation Evidence Museum, but sadly it was closed. I heard that DInosaur World was something to see, but it was too hot to do any more outside exploring. So they will have to wait until next year. This entry was posted in Glen Rose, Historic Sites, Other States - Texas, Parks and tagged Apatosaurus, camping, Carnivores, Dinosaur Valley State Park, dinosaurs, Herbivores, New York World's Fair, Paluxy, Paluxy River, sauropod, T-Rex, theropod, tracks, World's Fair on August 12, 2015 by admin. I was on my way to get milkshakes at Sonic (1/2 price after 8 pm) when I came upon this handsome fellow. He let me snap a couple of photos and then moseyed along to find better plants to nibble on. The Texas Longhorn can have horns that go up to 7′ across. I went on to see if there was a nice sunset and found a crane. And that was my night. 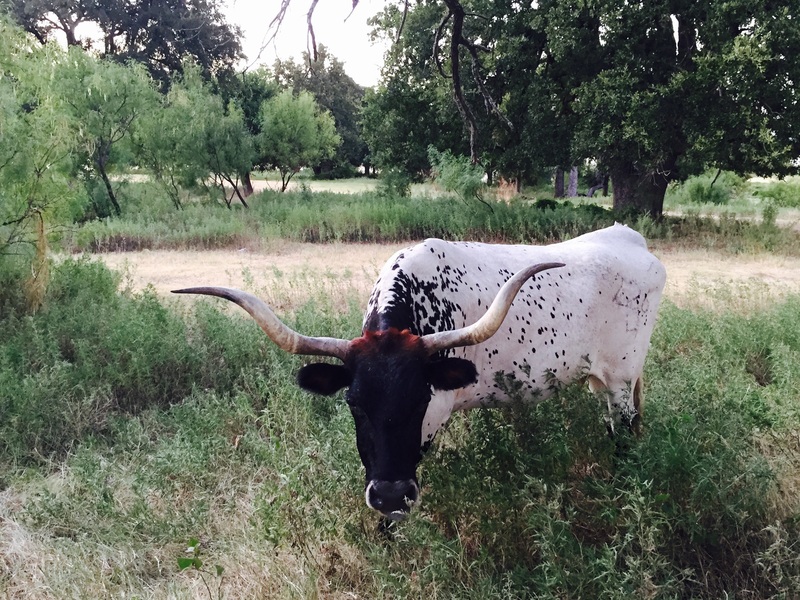 This entry was posted in Farms and Gardens, Granbury, Other States - Texas and tagged crane, evening, Granbury, grazing, Lake, longhorn, sunset, Texas, Texas Longhorn on August 11, 2015 by admin.